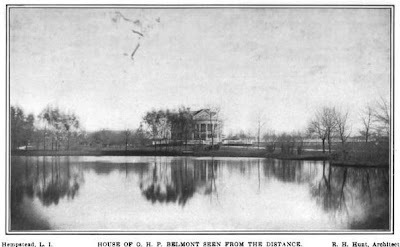 'Brookholt', the Oliver Hazard Perry Belmont and Alva Vanderbilt Belmont estate designed by Richard Howland Hunt of Hunt & Hunt c. 1897 in Hempstead. Following Alva's divorce from Willie K., she married O.H.P. 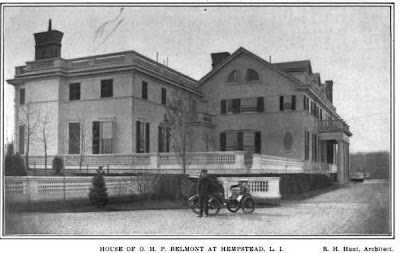 Belmont and the two commissioned Hunt to design yet another house for them (they had a handful of Richard Morris and Richard Howland Hunt designed houses). 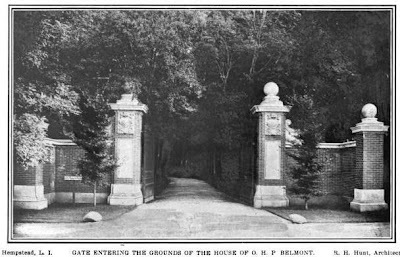 Belmont was the son of August Belmont, the American agent to the Rothschilds banking empire. 'Brookholt' was demolished sometime in the 1950s. Pictures from Architectural Record, 1902. Awkward, top-heavy, graceless. But the columns do remind one of Marble House, no? And an odd choice of locale. 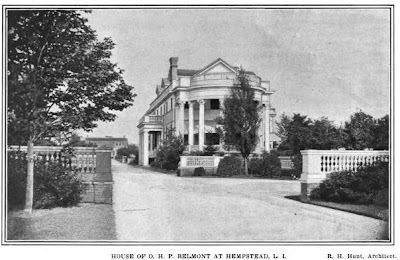 Was Hempstead "social" when the ultra social Belmonts built there? And why, I wonder, did Alva abandon it less than 15 years after its construction to build her fabulous Beacon Tower only 10 miles away? I remember reading in "King Lehr and the Gilded Age" by Alva Belmont's friend Elizabeth Drexel, that a workman lost his life during the construction of Brookholt, and the surprisingly superstitious Alva Belmont was convinced that he haunted her bedroom. Could that be the reason? Perhaps we'll never know. AAL - yes I agree. Anonymous - Beacon Towers was built after O.H.P. had died so I imagine she was moving on (she had a tendency never to stay in any one house very long). Hempstead doesn't provide the views that Beacon Towers would have anyway. I don't know why he chose Hempstead though. Alva had been at Idle Hour before this on the South Shore, pretty far removed as well. I do know that Willie K. built that house as a hunting retreat, which explains its location. I attended a high school in Mineola that was a potato farm before the school was built in 1930.Given the fact that Mineola and the surrounding areas inlcuding Hempstead were still largely farmland at this time, its likely she built this house as a central transit point between the rural Oakdale and her townhouses in New York City. Beacon Towers was more of Alva's last hurray before she departed the architectural scene in the US. It was primarily used by her and her allies during the Suffrage Movement. She would hold retreats and rallies here and the house, like so many others she built, did not really serve its intended purpose. According to the SPLIA book, this was the last project undertaken by the Hunt family for Alva. As for Brookholt, it seems that among all the farmland Hempstead was a major outpost and trading center on the still largely rural Long Island. I know people from Valley Stream still had to travel to the post office in the mid-1840s in Hempstead. 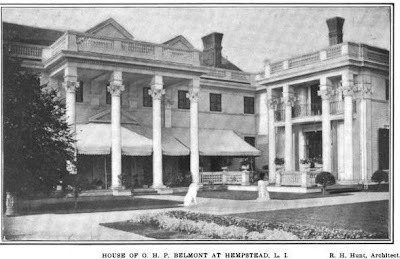 However, it seems that the Gilded Age millionaires contributed to the growth of Hempstead by building their homes here, which increased commerce as supplies were required to maintain the mammoth estates. Zach, just as I pushed 'send' on my previous comment, I had a realization. This house closely resembles the old Santa Monica beach house of Marion Davies, most of which was demolished years ago, but one wing still stands and just reopened as yet another beach club. The weird thing about the rear is that the entablature sits on those little blocks before it meets the ionic columns. Notice the columns in front don't look like this. Could it be they ordered columns that were too short and had to figure out how to make them work? It certainly is strange. That's one heck of a mistake! But notice on the rounded porch, that there is a strangely deep cornice that hangs down past the window line on the house. Maybe those were on the same order!!! Stables, good; alas, the house is like a barn. And probably about as comfortable. OHP Belmont died at Brookholt on June 10th, 1908 of septic poisoning following an operation for appendicitis. As was common at the time, the operation took place in the house itself. In early 1909, Mrs. Belmont put Brookholt on the market. The press speculated that unhappy memories about Mr. Belmont's death was the reason. The property, however, did not sell, and on October 16th, 1915, it was offered for sale at auction. 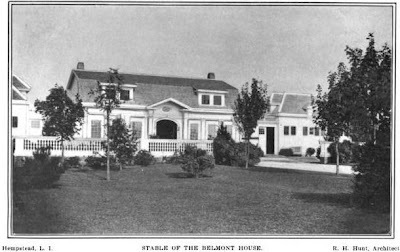 Press reports stated that the Estate and its 35 acres of property had cost Mrs. Belmont $300,000, but at auction it did not reach the minimum bid of $100,000 so it was withdrawn. The contents were auctioned the same day, but "fetched" low prices, according to a NY Times article. Brookholt seems to have faded from prominence until April 29th, 1933 when a raid by Federal Agents revealed that the mirrored dining room contained one of the most elaborate stills ever discovered "in the Metropolitan area" with the control equipment housed in Mrs. Belmont's former "rose colored bedroom" above.One of the agents involved stated that the equipment and surroundings were highly polished and the whole resemebled the engine room of a ship. Federal agents estimated that the value of the still was $100,000. The article mentioned that the house was owned by the Cold Stream Country Club which had its golf course on the property. Awkward yes. And yet I think if you begin to strip off certain elements it takes on a very stately persona, that while imposing, loses some of its top heaviness. First to go would be the flat roofed Federal "wing" bolted onto the corner of the main structure. It looks like a later, poorly designed institutional addition but was obviously original. Second would be the bolted on portico on the back with the "oops" columns and pilasters. The house would be much more genteel without it. As for the semi-circular portico on the end, it's overscaled and unexpected for the end of the house, but I like it just for those reasons. That said, it would be the more fitting portico for the back of the house. As for those "oops" columns on the back, they match the height of the columns on the semi-circular portico, but whereas the tableture on the side portico partially covers the second floor windows and views, it is cut away on the back portico so that the windows/views are not blocked. Both solutions were poorly thought-out. My parting shot - someone must have loved balustrades becuase they are everywhere; top, middle bottom, all the way around and all over the grounds. As completed the house looks very "designed by committee." so glad i found this. I'm working on New York suffrage, so i can tell you that immediately upon Belmont's death in 1909, Alva stepped out in a suffrage parade on 5th avenue! It was shocking, but clearly, all the moves she made after that were tied to her work for "The Cause." Brookholt was actually located in East Meadow on Front Street. The site was close to the elite Meadow Brook Hunt Club. After Alva moved out, she tried running the estate as a teaching farm for women. This endeavor lasted only one year. This is a late add -- but I recently found a picture of the house burning - not being razed.